The diagram shows how tea leaves are processed into five tea types. Summarize the information by selecting and reporting the main features and make comparisons where relevant. Given below is a model answer for this task. Send us your writing samples for a free band score estimate or get a detailed analysis of your writing for a fee. 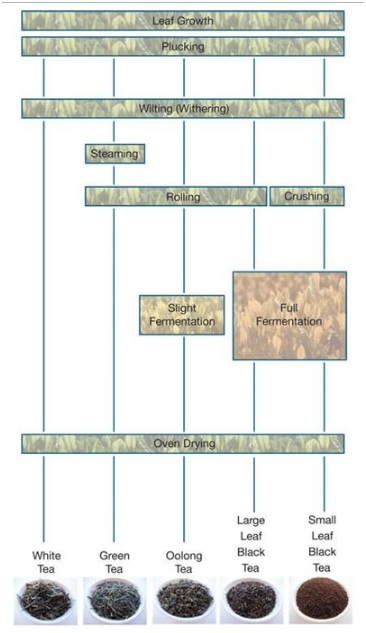 The given diagram illustrates the processes involved in the production of five different kinds of tea. The first step is the growing of tea plants and the second step is the plucking of tea leaves. The plucked leaves are then wilted or withered. Withered tea leaves are then dried in an oven to produce white tea. However, green tea needs to be steamed and rolled before getting dried in the oven. In order to produce Oolong tea, the withered tea leaves are rolled. The rolled leaves then undergo slight fermentation and the fermented leaves are then dried in the oven to produce Oolong tea. The process of making large leaf black tea is slightly different from the process of making small leaf black tea. To produce large leaf black tea, the withered leaves are rolled before they undergo full fermentation and get dried in the oven. To produce small leaf black tea, the leaves are crushed instead of getting rolled. The crushed leaves then undergo full fermentation and are dried in the oven.